Grout comes in so many colors and textures making it a versatile finish that is used with all tile applications. But grout cleaning and tile cleaning can be tough. One of the challenges with tile and grout, however, is keeping it clean. Everyday living can be hard on grout lines. You can scrub the tile yourself but professional cleaning is the best way to maintain the grout and the tile to perfection. We are able to use machinery special developed for steam cleaning of your tile floor as well as commercial grade chemicals you aren’t able to get. There are so many benefits to using us for your tile cleaning needs. Here are some of our favorite! With professional tile and grout cleaning we are able to use special cleaners steam to remove the dirt and grime that accumulates over time. It is possible to revitalize just about any older tile floor with a thorough cleaning. Professional cleaners come to your home with all the cleaners necessary to do a good job and the knowledge of what cleaners work bet on different types of tile. 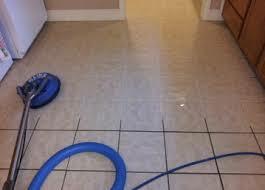 The final result is a deep clean that does not damage the tile. Having a professional cleaning done every year or two will remove the dirt and grime that can damage tile and grout. This can protect both and extend their lives. A professional can come in and do the job in a very short period of time. You can be working on something else or play with the kids while the job gets done. That is time efficiency at its best. What homeowners forget to take in consideration is that the cost of cleaners and equipment adds up quickly. Plus, there is the cost of the time you have to put into the cleaning itself. Paying a professional to do it instead is a wise investment of both money and time. We are able to preserve the perfect clean look of professional tile cleaning by using sealers to finish the look and keep your tile looking freshly cleaned.